Mérida (Extremaduran: Méria) is the capital of the autonomous community of Extremadura, Spain. It has a population of 55,568 (2008). Among the remaining Roman monuments are the Puente Romano, a bridge over the Guadiana River that is still used by pedestrians, and the longest of all existing Roman bridges; an important fortification to defend the bridge, and later used by the Moors, called Alcazaba; the Temple of Diana; the remains of the Forum, including the Arch of Trajan; the remains of the Circus Maximus; the Acueducto de los Milagros (aqueduct); a villa called the Villa Mitreo; the Embalse de Proserpina and Cornalvo reservoirs; the Circus, the Amphitheater, and the Teatro Romano, where a summer festival of Classical theater is presented, usually with versions of Greco-Roman classics or modern plays set in ancient times. One can also visit the Morerías archaeological site, Santa Maria's Cathedral, and many other locations all around the city to watch digging in progress, as well as the Museo Nacional de Arte Romano (designed by Rafael Moneo). There are several notable buildings built recently, such as the Escuela de la Administración Pública (Public Administration College), the Consejerías y Asamblea de Junta de Extremadura (councils and parliament of Extremadura), the Agencía de la Vivienda de Extremadura (Housing Agency of Extremadura), the Biblioteca del Estado (State Library), the Palacio de Congresos y Exposiciones (auditorium), the Factoría de Ocio y Creación Joven (cultural and leisure center for youth), the Complejo Cultural Hernán Cortés (cultural center), the Ciudad Deportiva (sports city), the Universidad de Mérida (Mérida University), the Confederación Hidrografica del Guadiana (Guadiana Hydrographic Confederation designed by Rafael Moneo), the Puente Lusitania (Lusitania Bridge over the Guadiana River designed by Santiago Calatrava), the Palacio de Justicia (Justice Hall), etc. 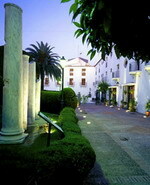 The ancient Torreorgaz Palace is built on Arabic foundations with a linteled door and a Baroque coat of arms. It is in the heart of the Cáceres's old town and artistic centre, which has been declared a World Heritage Site. 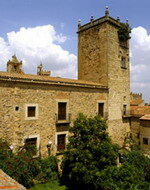 This 14th Century Parador, overlooked by its narrow tower, was founded by Diego García de Ulloa, knight of the Order of Santiago. Gothic, Renaissance and Baroque styles are reflected in the building and its surroundings. Its internal courtyard, cobbled exterior, exposed wooden beams, and the lounge's original mantelpiece make up the hotel's interior decoration. The bedrooms, decorated in soft shades of cream are tasteful, spacious and comfortable. Rosemary roast goat kid, merluza a la cacereña (hake dish), ancas de rana a lo mozárabe (Arabic-style frogs’ legs), roast young lamb shank with patatas a lo pobre (potatoes with green peppers and onions), and roast suckling pig... Where do you begin? The hotel also has a wine-cellar featuring more than 300 varieties of Spanish wine. 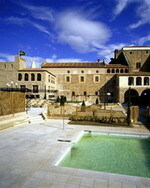 The hotel is housed in an old hospital that was intended for pilgrims in the 15th century. The parador takes its name of' Zurbaran' from the fact that the adjacent Guadalupe monastery preserves a collection of pictures by this famous artist. The impressive fortress-monastery of Guadalupe is a centre of pilgrimage in the region of Extremadura. They are decorated in rustic style. Most of them are located around the inner square. spacious common rooms on the inside with white walls and bedrooms which recall the religious function as convent. Monastic cod, Extemadura ajo blanco (almond and garlic gazpacho), Extremadura migas, Iberian sausages, lamb stew, chestnut pudding, Guadalupe muégano cookie. Savour the simple local cuisine and bon appétit! Plasencia - is a walled market city in the province of Cáceres. The focal point of the old city is the market square (Plaza Mayor), where a weekly tax-free market has been in operation every Tuesday since the foundation of the city. 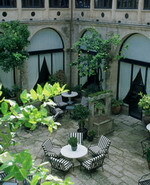 The hotel is in the former 15th-17th century convent of Sto. Domingo, founded by the Zúñiga family in the mid 15th century, in the Gothic style inside and in part of the exterior. Strategically located in the historic centre of Plasencia, this is the ideal place to explore the architectural beauty of this singular city and the beautiful landscape around it. Try the exquisite cooking of Extremadura: Potato soup, partridge stew, lamb with local honey, compote of figs from La Vera, and the famous migas. During your next stay in Plasencia, don't miss our night bar - A place to have conversation with friends, to feel well with your partner, a space to find relaxation. We have selected the best jazz music, both instrumental and vocal; a warm and soft illumination with dozens of candles and a selection of the best beverages together with the best service. 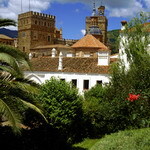 Trujillo - A beautiful small town with many restaurants and bars. Perched on a hill some 580 meters above sea level, dominating an extensive plain between Extremadura's two major rivers the Tagus and the Guadiana, lie the Towers of Trujillo. 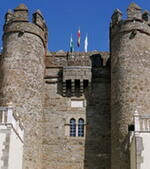 Trujillo is crowned by its Moorish Castle, built on Roman foundations, ramparts and fortifications. Just a few miles from Monfragüe's National Park, Trujillo sits in a privileged location. It is merely 47 km from Cáceres, one hour by car from Guadalupe, 90 km from Mérida, Plasencia and Navalmoral de la Mata. Easy connection with Madrid is made possible by a motorway, the A-5, stretching for 250 km. This hotel is situated in the converted Santa Clara convent which was founded by the order of the conceptionists in the 16th century. The convent building is simply laid out around a central cloister which now has three renaissance fountains and lovely plants and trees growing around them. Nuns used to live in the convent until it was converted into a hotel, therefore their cells have been used as rooms for guests. There are 45 doubles and a suite, distributed around a renaissance cloister and its well, with views of the town or nearby fields. The refectory, a vaulted room with a magnificent tiled wall is where international and Regional cuisine can be sampled. Ideal for rest, leisure work, the Parador has monastic style common rooms and details, spacious, quite and pleasant living rooms, noble bedrooms in which wood takes preference.